Summary: Learn how to join pipes using solder, join pipes using a compression joint, join pipes using a speedfit joint, join pipes using a threaded joint and join pipes using a Hep20 joint. There are a number of methods for joining lengths of pipe together. Whatever method you use and regardless of the material the pipe is made from, the ends must be cut square and have the burrs removed. 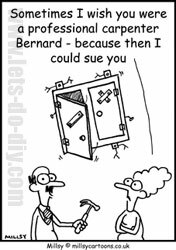 This will ensure a watertight fit. The most common methods for joining pipes are soldered capillary joints, compression joints, speedfit joints, threaded joints and the Hep20 joint. Solder is a metal alloy supplied in the form of wire on a coil. When solder is heated it melts and forms a watertight seal around the joint between two pipes. Solder-ring joints are made with the solder applied to the inner surface of the joint, which means no additional solder has to be used. End-feed joints need the solder to be added. Soldering a copper pipe joint can be difficult to master and it may require practice before you become proficient. Problems occur when either too much or too little heat is applied. Not enough heat will result in the solder failing to make a complete seal, while too much heat will cause the solder to run out of the joint. When soldering always follow the blowtorch manufacturer's instructions and protect any adjacent surfaces with a soldering mat. It is also important to make sure there is adequate ventilation as the fumes are toxic. Here we are look at joining two lengths of pipe using an end-feed capillary joint. The lengths of copper pipe should already be cut to length and had the rough edges removed by filing. Ignite the blowtorch and let it heat up. While the blowtorch is heating up, thoroughly clean the end of the pipes and the end-feed joint with steel wool until they shine. 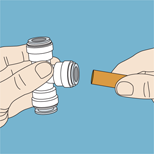 To create a totally clean joint, apply flux paste to the end of the pipe and inside the end-feed joint. Using a twisting motion push the end of one of the pipes into one end of the end-feed joint. Then fit the other length of pipe in the same way. With the blowtorch heat the first joint all the way around the pipe. From time to time touch the solder against the heated joint to see if it is hot enough to melt. When the solder is melting, apply it between the pipe and the end-feed joint. As the solder melts it will form a neat seal around the joint. Repeat the process with the second joint. After the joints have cooled, wipe away any excess flux and make sure that solder completely encircles the joint. Apply flux paste to the end of the pipe and inside the end-feed joint. A compression joint is used to connect lengths of copper or plastic pipe without using a blowtorch. It consists of a brass joint body, two small soft metal rings called olives, and two cap nuts which screw onto either end of the joint body. The lengths of pipe should already be cut to length and had the rough edges removed by filing. 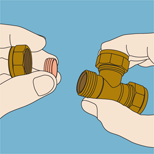 Unscrew one capnut from the joint body and slide it onto the end of one of the lengths of pipe. Slip the olive over the end of the pipe. If the olive has two sloping faces ensure it goes onto the end of the pipe the same way it was fitted. Fit the end of the pipe into the joint body and push together firmly. Push the olive up against the joint and tighten the capnut by hand. Grip the body joint with one spanner while you tighten the capnut with another, but do not over tighten. One and a quarter turns with the spanner will be sufficient. Fit the second length of pipe in the other end of the body joint using the same method. 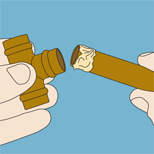 Unscrew one capnut from the joint body, if the olive has two sloping faces ensure it goes onto the end of the pipe the same way it was fitted. Grip the body joint with one spanner while you tighten the capnut with another, but do not over tighten. This is a simple method of joining plastic or copper pipes. The plastic joint is fitted with a toothed ring called a collet and an O-ring seal. Simply push the end of one of the pipes into the joint and the collet will grip the pipe. You will hear a click when this happens. Push the end of the second pipe into the other end of the speedfit joint. 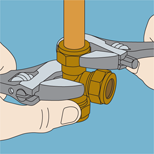 To release the pipe, push the ring tight against the joint as you pull the pipe free. Push the end of one of the pipes into the joint and the collet will grip the pipe. When making a threaded joint you always need to match the male connector to the female. Before making the connection PTFE thread-sealing tape must be wound around the male thread to create a watertight seal. 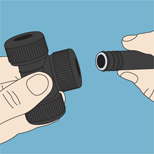 The Hep20 fitting is made from plastic and has an internal grab ring and an O-ring seal. It can be used to join a plastic pipe with a copper pipe. Before making the connection, check the ends of the pipe are smooth and have had any sharp edges removed otherwise the O-ring could be damaged causing the joint to leak. If using plastic piping a metal support sleeve needs to be pushed into the end of the pipe. Measure 25mm (1in) from the end of the pipe and mark with a pencil. This mark indicates the depth the pipe needs to be inserted into the fitting. Apply silicone lubricant to the end of the pipe up to the pencil mark. The end of the pipe can now be pushed into the fitting up to the pencil mark. It is important to ensure the pipe is fully inserted to prevent the water pressure blowing it out. Push the end of pipe into the fitting up to the pencil mark.